Today our team visited a Kathy A.P. 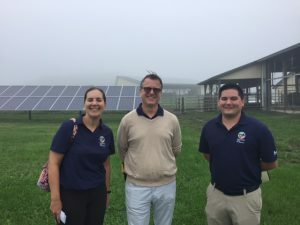 Mathias Agriculture grantee, Rock Hill Orchard and Woodbourne Creamery, located at the very top of Montgomery County. Rock Hill is dedicated to sustainable farming and business practices because they have seen the overall health and profitability benefits. 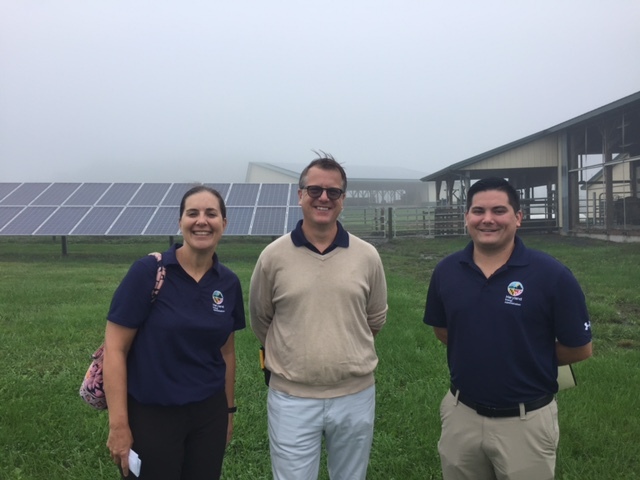 MEA Assistant Director of Programs Jennifer Gallicchio with owner John Fendrick in front of the ground solar array. Rock Hill’s owners John and Mary Fendrick purchased the property in 2010 and were featured in a 2013 episode of Maryland Farm and Harvest. The Fendricks compost onsite and use all-natural products made of kaolin clay to maintain their apple and peach trees. The next sustainable step for Rock Hill was to review their energy profile. Rock Hill used our state’s Kathy A.P. Mathias Agriculture grant to help install a 136 kilowatt solar photovoltaic system split rooftop and ground array. 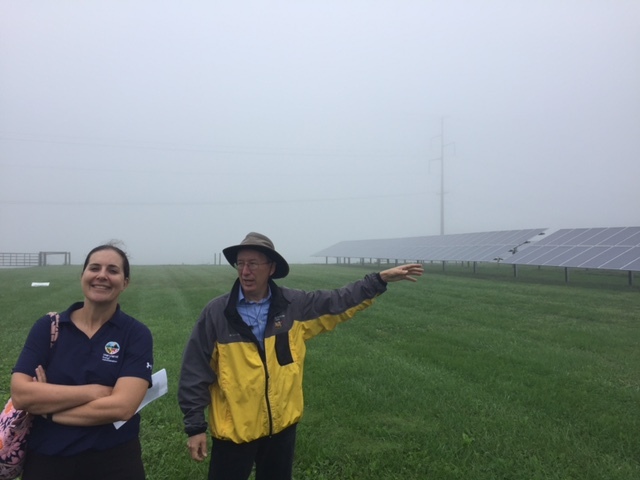 Incorporating partial roof mount solar panels allowed Rock Hill to maintain valuable farming land while greening their electricity source. 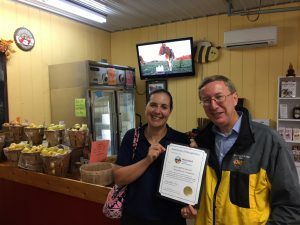 Rock Hill is Montgomery County’s only “Cow to Cone” ice cream shop and dairy. Their Guernsey cows eat grass year-round and are milked by a robot set to the cow’s schedule which yields 100 gallons of milk daily. 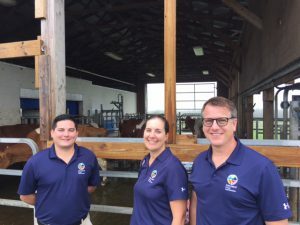 Seriously, their milking robot is amazing, click here and advance to 18:27 to see it in action. 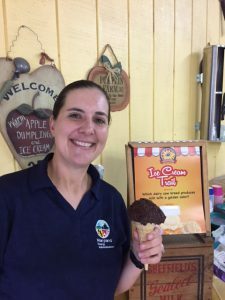 Rock Hill’s milk is pasteurized onsite along with the ice cream which is sold at their own market. Did we mention this place is a stop on the MD Ice Cream Trail? 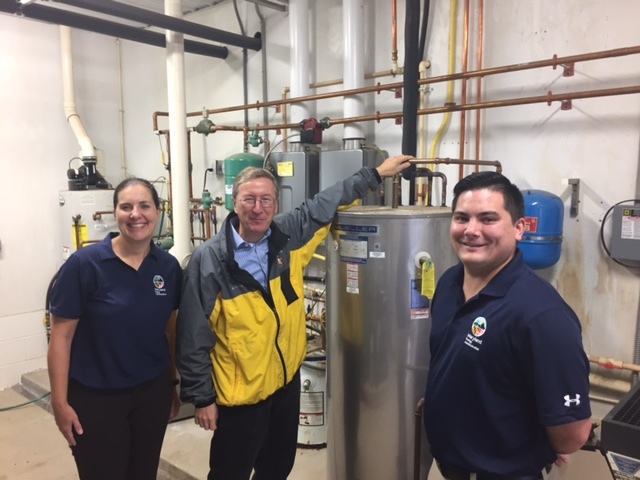 In addition to the solar panels, Rock Hill used additional state grant money to add a new compressor heat recovery unit to their dairy. The new unit captures or recycles heat necessary for processing the milk. Recycling heat is such a powerful way to maximize energy use, the Maryland Energy Administration offers a stand alone grant for Combine Heat and Power (CHP) projects. The state has helped to fund 44 CHP projects in Maryland to date. Rock Hill received a certificate of recognition for their efforts in energy efficiency and renewable energy. The new Kathy A.P. Mathias Agriculture grant is open and accepting applications till November 16. An informative webinar will be held on Tuesday, October 9th at 2pm. For an invitation to the conference call, please contact David Giusti (Phone: 410-537-4072). Despite the rain MEA had a great time visiting Rock Hill Orchard & Woodbourne Creamery. We highly recommend you visit too.